Does not accept players from the UK and Australia. Country Restrictions: Netherlands Antilles, Costa Rica, Israel, Russian Federation, United Kingdom (inclusive of Northern Ireland, Channel Islands and Isle of Man), Romania, Hungary, Australia or France. Online casino Manhattan Slots is determine to offer you a unique online gaming experience. 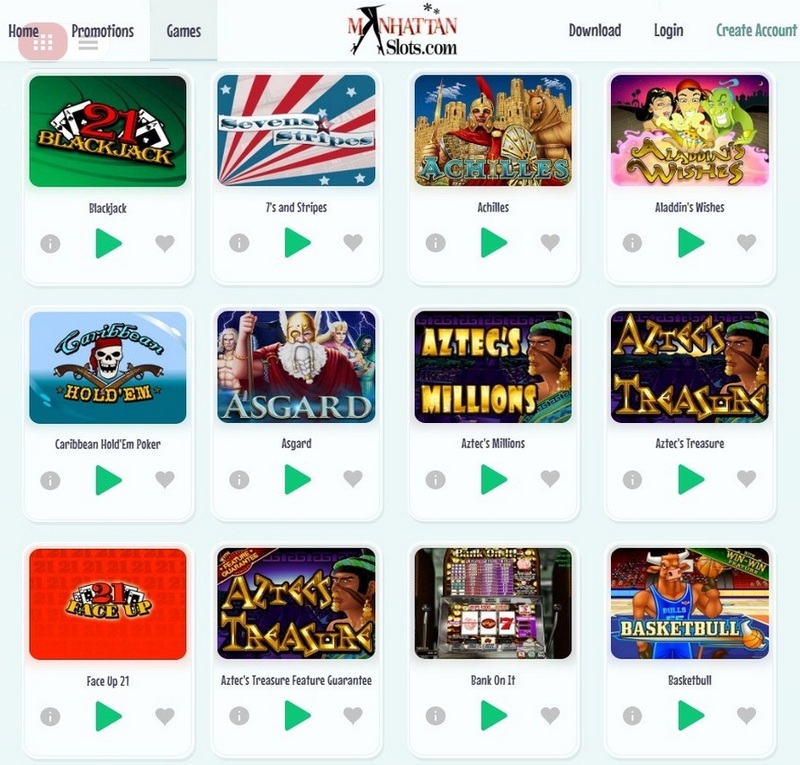 The online casino games of Manhattan Slots are designed to deliver the most realistic experience possible and uses most popular gaming software developed and licensed by Real Time Gaming (RTG). Manhattan Slots Casino offers a wide range of Real Time Gaming games. The casino games at Manhattan Slots offered are classified into online slot games, table games, video poker and specialty games. The preview section of the casino offers a systematic approach to accessing games. For example the slot machine games are further classified into classic, video and progressive slots. The video slot games are displayed by the number of paylines. The online slot games can be searched alphabetically as well. The other categories have fewer games and therefore list the games directly without sub classifying them. Ultimately a screenshot and brief description are available for each game. Roulette, blackjack, baccarat and craps are the most popular popular games. There are two new player welcome bonuses available for USA players at Manhattan Slots, each geared towards a different type of game. If you are primarily an online slot games player, you’ll want to check out the slots bonus, a 100% match of up to $747. This bonus only allows you to play slot machines and keno, but comes with a low 20x wagering requirement before you can cash out your winnings. If you’re a table games player, you’ll want to take the other new player welcome bonus: 100% up to $150. The only excluded games on this bonus offer are baccarat, craps, roulette and sic bo, and the playthrough requirement is still a rather reasonable 30 times the amount of your deposit and bonus. 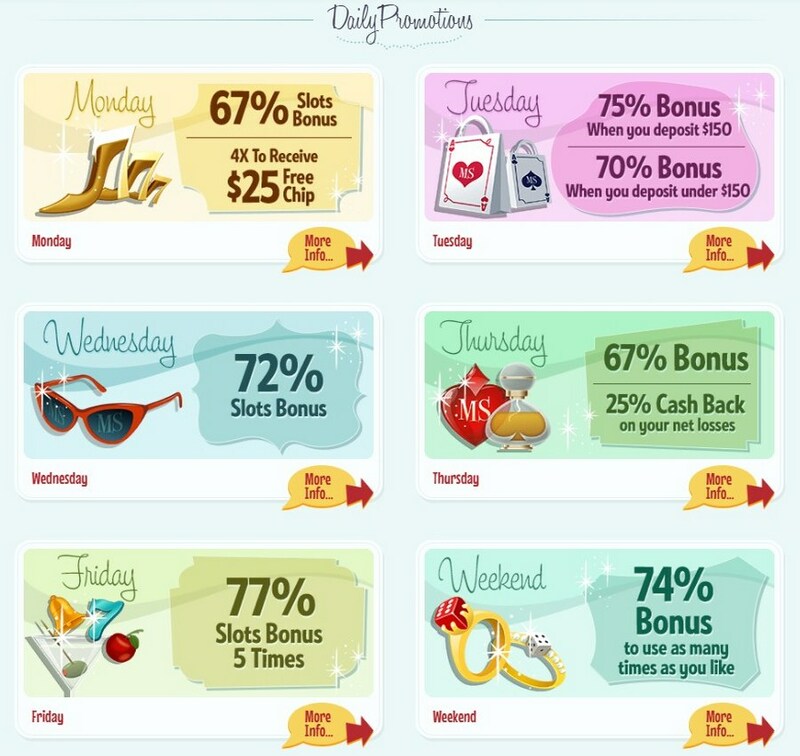 These online casino bonuses are both available on each of your first two deposits. That means you can take one of these casino deposit bonuses twice, or if you’d like to mix things up, you can take each bonus once. It is important to note that these bonuses are not cashable: while they can be spent in the casino, they can never be cashed out, so only your winnings from the bonuses can be withdrawn. Players have a wide range of deposit options available to them at of Casino Manhattan Slots. The online casino accepts payments in US dollars, British pounds and euros. Deposits can be made through credit cards, but no withdrawals are allowed to credit cards. A large number of alternative electronic payment options are available that allow both deposits and withdrawals. These include Neteller, eWalletXpress, UseMyWallet, EcoCard, Click2Pay and Moneybookers. Players can ask for withdrawals through checks couriered to them. Manhattan slots casino restricts withdrawals to 3,000 credits per week, except in the case of progressive jackpot wins. Customer service at Casino Manhattan Slots is available through live chat, telephone, and email, and is available 24 hours a day, 7 days a week. Players are advised to check out the FAQs section before contacting customer support. The FAQs are divided into sections like General Questions, Bonuses, Technical and Cashier. Customer support is available through toll free telephone and fax to United States players. E-mail support can be had by filling in the online form. The best way to contact customer support, however, is through online chat. The online casino Manhattan Slots is a part of the Club World Casino Group, which is one of the most trusted names in the online gaming community. The Manhattan website itself has been in operation since 2010, and has built up an impressive reputation and high customer satisfaction ratings in its many years in the business. Along with its excellent support staff, many players have also said they enjoy the unique “classic New York” theme, which the site really does a great job of evoking.